Why the confusion? Why the indifference? 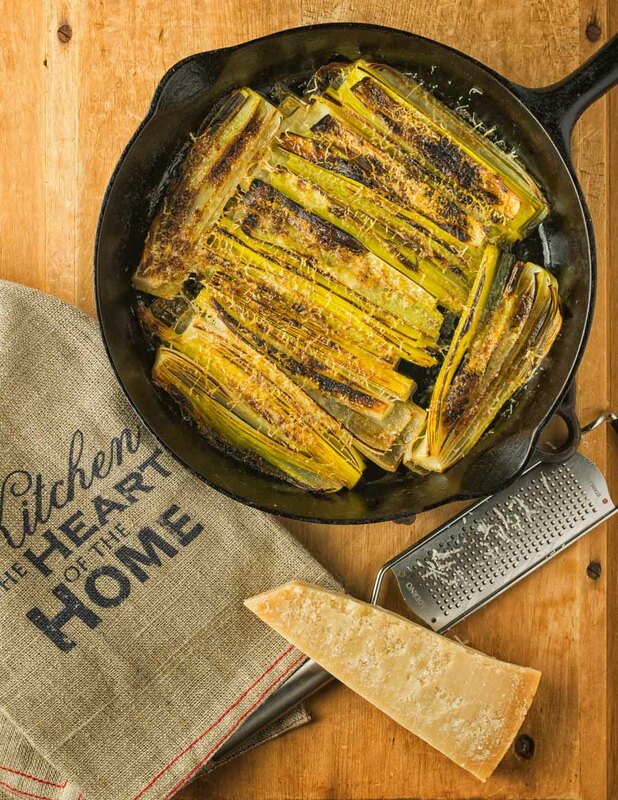 Braised leeks with parmesan is a great side dish for any roasted meat or poultry. Or even as a vegetable starter. Put a couple of these on a plate. Drizzle this with olive oil and maybe a squeeze of lemon juice. Serve it as a first course. Crazy good. Foodie good. Leeks are much milder than onions. Braised leeks get this meltingly tender texture. Mild onion like flavour and melting. Why don’t you want to eat them? This dish is easy. Braise the leeks, sprinkle some cheese on them and flash them under the broiler. Make this. Tell your friends. Spread the word. Leeks are the new kale! OK – maybe not – but they are tasty. Give them a chance. 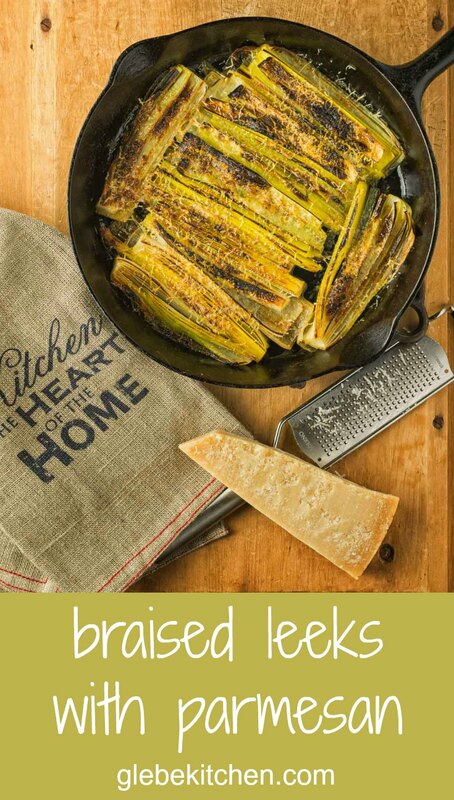 Butter braised leeks with parmesan finished under the broiler. Earthy goodness that pairs with any roasted meat or poultry. Heat a broiler-proof skillet over medium-low heat. Trim the leeks, cut them in half lengthwise and quarter them. Melt butter in skillet. Add leek quarters, thyme and enough stock to almost cover the leeks. Add a pinch of salt. Simmer briskly. You want to ultimately boil away all the liquid, leaving only the butter behind. Pay attention. You don't want the butter to brown at the end. This takes 15-20 minutes. Sprinkle the cheese over the leeks. Broil briefly to brown and melt the cheese. In italian, sides and stuff. Bookmark the permalink. My husband loves leeks! But I always just saute the darn things or throw them in soup. I can’t wait to try something new with them!! He’s going to love this one I bet. I love leeks too and this one’s a favourite. They go really well with a classic roast chicken. A little pile of leeks under a piece of chicken with pan sauce drizzled all around. Delicious. This looks amazing!! I’m not usually a big fan of leeks, but you’ve definitely talked me into trying these! Plus you can never go wrong with butter and parm! Can’t wait to make these soon! I hope you will be pleasantly surprised. I love leeks, reminds me of my childhood! My dad is French, and he used to make a dish similar to this, using either leeks and sometimes white endive. Brings back memories! I’ll have to try this, looks great. You know, I use leeks rarely and usually in a soup. And I’ll have a bunch left over and have no idea what to do with them. Great idea, how innovative! What a great idea! I usually only use them in a potato and leek soup, but this is a must try! Thanks for sharing! If you like leeks this one’s a fun way to mix it up. 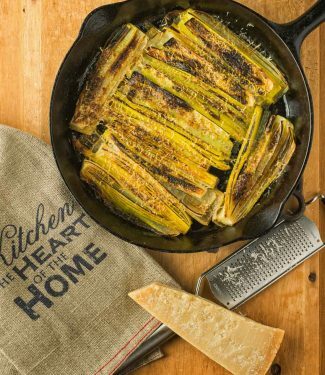 To make this vegan I would suggest replacing the butter with olive oil and skipping the whole parmesan flash-broil step. Maybe just braise them and serve them as an appetizer with a bit of a French dijon vinaigrette? A sprinkle of chive? More of a warm salad… would be delicious I think. I’ve really wanted to try growing leeks in the garden, you’ve inspired me to do it this coming spring! Pinning, thanks for the awesome recipe! Mmmm… Garden fresh leeks. That would be awesome!